With all of the choices available to select from, how can you be sure you’re selecting the right cherry juice for your needs. After reading this quick post, you’ll soon know exactly what to look for when decide what cherry juice is just the right fit for you and your family. As more and more people are choosing cherry juice to fight joint pain caused by gout and arthritis doesn’t it makes sense to get the right juice? The sweet cherry or dark cherry is often enjoyed as a tasty snack. 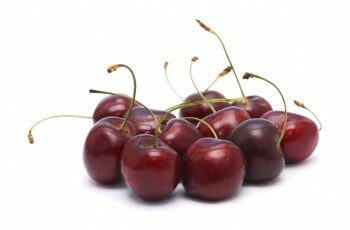 It is the most popular type of cherry sold at farmer’s markets and in the produce section of your local grocery store. The fruit itself is rather large and has a distinctive dark hue. Check out this photo of the dark or sweet cherry. The other variety is the Montmorency tart cherry. While it is the most popular cherry used for baking and recipes, it is usually not found in the produce department or farmer’s market. The reason is this cherry is more tart than the sweet variety. That is why it is relied upon as the main variety of cherry for baking. The reduced naturally occurring amount of sugar doesn’t make recipes overly sweet. Here is a photo of the Montmorency tart cherry. As you can see, the Montmorency cherry offers a bright red-hue. 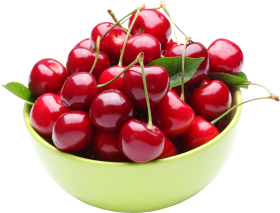 In addition, it the type of cherry that has the majority of the studies for insomnia, arthritis, gout and anti-inflammation studies. Cherry juice is packed in plastic bottles, aluminum cans or glass bottles. So when you’re drinking cherry juice, the taste is important. Consumers have reported that they prefer drinking and eating food that is packed in glass bottles, especially cherry juice. The reason is when drinking cherry juice from glass bottles, you don’t have to worry about plastic leaching. Leaching is widely known in the food industry and it occurs when food, especially juice, it packed in plastic containers. The food actually begins to leach or “pull” plastic molecules from the plastic bottle back into the food. This could affect the taste of the food. All juice isn’t the same. The one thing that you want to look for when selecting cherry juice is the brix (pronounced bricks) amount. The brix indicates the natural sugar content in the juice. The highest quality of cherry juice is 68 brix. Lower brix numbers could mean poor quality of product. Also, if the brix amount is not published on the company website or on the bottle, contain the company, prior to making a purchase, to ensure you are buying 68 brix juice. Finally, concentrated tart cherry juice delivers a high amount of powerful anti-oxidants. This is measured by the ORAC value of the food. The higher the ORAC, which stands for Oxygen radical absorbance capacity, the better. One serving delivers a whooping 12,800 ORAC units compared to 6,800 of the dried fruit. So the next time you’re looking for a natural way to fight joint pain due to arthritis or gout enjoy some concentrate tart cherry juice in a smoothies, sparkling water or even in yogurt. But most importantly, enjoy daily and look for the Montmorency cherry juice available from the Traverse Bay Farms region of Michigan. 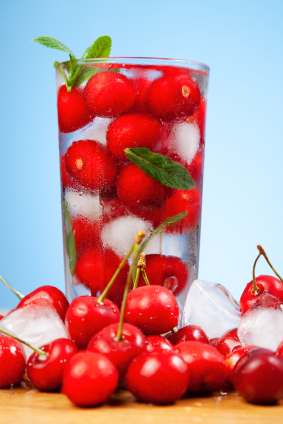 This entry was posted in Cherry Juice, Tart-Cherry and tagged how to select the right cherry juice, selection the right cherry juice on May 12, 2015 by admin. Did you know that Michigan is the number state in the United States when it comes to tart cherries? That’s right, over 70% of all of the Montmorency tart cherries are grown in the Northwestern corner of the lower peninsula of Michigan. 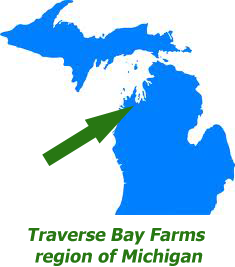 This section of Michigan is commonly referred to as the “Traverse Bay Farms region”. In addition, it also carries the nickname of the “Cherry Capital of the World”. The reason for the first nickname is this region of Michigan is located on 45th parallel north. This is halfway between the North Pole and the Equator. The 45th crosses North America, Europe and Asia and you’ll find some of the best grown fruit along the 45th. The reason it is not to hot or not cold for fruit and vegetable production. In addition, the sandy soil of the region helps to make it the epic center for tart cherry farming. The soil itself is also the secret behind the explosive growth to farmers in the region. The sandy soil is perfect to drain away water from rotting the roots. Finally, this region of Michigan receives over six feet of snow annually. What many people may be unaware is that snow is actually an insulator. The deep snows helps to keep the trees warm during the winter and helps to prevent the ground from a deep freeze. Rightly so, the northwestern part of Michigan grows annually 200+ million tons of cherries and touts some of the most beautiful shoreline and fields in the entire state. Check out this video of tart cherry orchards from a seat of a low flying airplane. In the video, you’ll see some of the tart cherry orchards that actually some of fruit the region is world famous. As the countless blossoms appear on the trees, the pedals will soon drop and the beautiful, colorful blossom will be soon replaced with a ruby-red tart cherry. This magic of nature usually occurs for about week during the middle of May. After the cherries start to appear, they start to slowing turn a deeper and deeper red until they are ready for harvest. The cherry harvest in Northern Michigan usually begins the second week of July. However, just before the official cherry the Traverse Bay Farms region celebrates the “National Cherry Festival“. During this two week period countless locals, tourists and vacationers enjoy all things cherry and more. Attendees enjoy cherry pit spitting contests, sand sculptures, cherry pie eating contests and more. In addition, the Navy Blue Angels appear at the Cherry Festival every few years. As you can see, the entire region is all about the cherry during the annual cherry harvest. This entry was posted in Tart-Cherry and tagged michigan grown cherries, traverse bay cherries, where are cherries grown on April 12, 2015 by admin. “Where do I buy cherry juice?” is probably the first question you ask yourself after you learn about all of the amazing benefits of this Michigan-grown super fruit. You have read all of the research and download several white papers teaching about the arthritis fight capability of the tart cherry. You have watch videos on YouTube and even listened to some podcasts on BlogTalkRadio, the next step is decide where to purchase cherry juice from. However, with all of the brands offering cherry juice and places to buy it, where do you start? That is the reason we’ve created this page. Not to recommend any specific brand, but to provide you with a checklist to use when purchasing tart cherry juice concentrate for you and your family. Question #1: Where are the cherries grown? This is probably the most important question many people have when buying cherry juice. Did you know that Michigan grows over 65% of all of the Montmorency tart cherries in the United States? This means this is the probably the best place to begin your search. Look for companies that are located in Michigan. The reason is if they are located in Michigan, they probably will be using Michigan-grown tart cherries to make the tart cherry juice concentrate. Question #2: Does the brand or company state Never-Imported cherries or cherry juice? Now that you can agree that buying from the #1 cherry growing region is important, next look for cherry juice brands that state they are using Never Imported Cherries or cherry juice. Did you know that several companies selling cherry juice and cherry product don’t know where the cherries are actually grown? Some of these companies as selling cherry juice made from cherries imported from Poland, Turkey or even China. I don’t know about you, but I prefer not only to support American farmers but I like to only eat food that is grown in the United States. The next question to ask any company is to prove they are using never imported cherry juice. This is either stated on their website or printed right on the product label. If the company can’t prove they never import tart cherries and cherry juice to make their product, consider looking elsewhere. Question #3: What types of cherries are used? When the label simply read “Cherry Juice” it may not mean what you think. Cherry juice can be made from sweet or dark cherries as well as tart or red cherries. So find out specifically the type of cherries used. Over the last several years, the majority of the research published in the natural health benefits of cherries have been conducted on the tart or red cherries, specifically the Montmorency variety. In addition to the type, also ask about the variety. 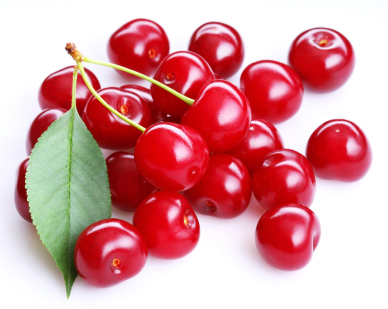 The reason is there are many types of red cherries including the Balaton and Montmorency. As mentioned above, if you want the type of the cherry that the majority of the research has been conducted on, select the Montmorency variety over the Balaton. Question #4: How is it packed? 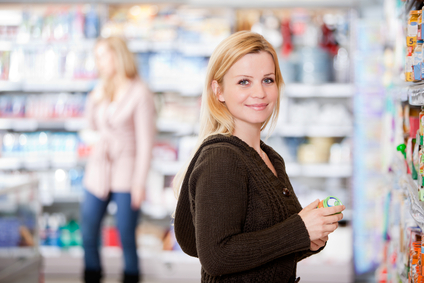 When purchasing any type of food product consider food products, including cherry juice, that is packaged in glass bottles. Glass prevents plastic leaching. Plastic leaching is widely known in the food industry and this is when the food inside of the bottle actually “pulls” or leaches plastic molecules from the plastic container directly back into the food product. So look for cherry juice that is packed in glass bottles. Another benefit for enjoying cherry juice in glass bottles is it is shelf stable until you open to the bottle. This helps to save you hassle since you can store extra cherry juice in your pantry rather than taking up valuable space in your freezer or refrigerator. Question #5: Is it sediment-free? Sedimentation in cherry juice may be an indication of poor quality cherry juice, an inadequate bottling process, using older cherry juice concentrate among other factors. Sedimentation is when thick residue builds up on the bottom of the bottle due to the actual breakdown of the product. If you have used cherry juice in the past, you’ve may have seen or even purchased juice that contained sedimentation. Sediment-free means the product offers a “free flow” or it doesn’t contain chunks in the juice itself. Below is a quick reference guide to help you make the best decision for you and your family when purchasing tart cherry juice concentrate. Where are the Cherry Grown? Does the brand or company state Never-Imported cherries or cherry juice? What types of cherries are used? The more Yes’s you have checked the better. This entry was posted in Tart-Cherry and tagged buying the right cherry juice, buying USA grown cherry juice, where to buy cherry juice on April 12, 2015 by admin.